…For 2007, DARPA introduced a new challenge, which it named the “Urban Challenge”. The Urban Challenge will take place on November 3, 2007 at the site of the now-closed George Air Force Base (currently used as Southern California Logistics Airport), in Victorville, California (Google map). The course will involve a 60-mile (96 km) urban area course, to be completed in less than 6 hours. Rules will include obeying all traffic regulations while negotiating with other traffic and obstacles and merging into traffic. While the 2004 and 2005 events were more physically challenging for the vehicles, the robots operated in isolation and did not encounter other vehicles on the course. The Urban Challenge requires designers to build vehicles able to obey all traffic laws while they detect and avoid other robots on the course. This is a particular challenge for vehicle software, as vehicles must make “intelligent” decisions in real time based on the actions of other vehicles. Other than previous autonomous vehicle efforts that focused on structured situations such highway driving with little interaction between the vehicles, this competition will operate in a more cluttered urban environment and requires the cars to perform sophisticated interactions with each other, such as maintaining precedence at a 4-way stop intersection. 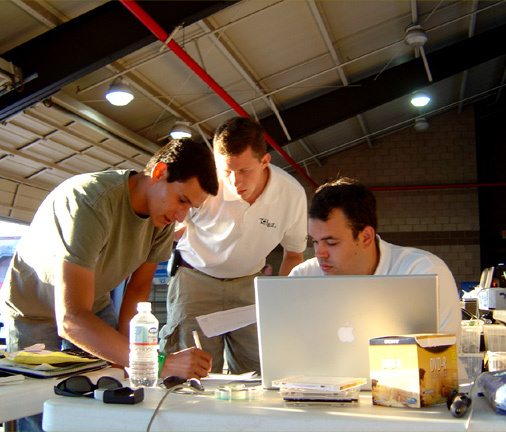 Stanford’s team “won” the 2005 Grand Challenge along with three other successful finishers [Terramax also finished, but 12 hrs vs. 10-hour maximum time]. NOVA did a special on that event, available as DVD or online. The 2007 Stanford effort offers a video of their new “Junior” demonstrating its competence. You can tell these are the “good guys” by their laptop selection. Possibly the most remarkable part of the Grand Challenge story is the success of #4 finisher Team Gray, some 37 minutes behind Stanley. This is a privately funded New Orleans insurance company, with Tulane student tech help. And they lost 3-4 weeks from an abbreviated development schedule due to Katrina [thus their vehicle’s name “Kat-5”]. Team Gray has qualified for the Urban Grand Challenge as well. …In an unheralded fourth place, though — just 37 minutes behind the winner — was an entrant from Gray Insurance, a small, family-owned casualty company in Metairie. Fourth place may not sound like any big whoop until you realize that the Gray Team finished ahead of cars from some of America’s most elite technical universities, as well as from a number of big defense contractors. In fact, theirs was one of only five vehicles that managed to even cross the finish line. Since Mr. Gray admits to knowing virtually nothing about computers, he turned things over to Keith B. Goeller, who heads Gray’s 10-member IT department. The plan, says Mr. Goeller, was to keep his team small, look for the best off-the-shelf products, and then assemble them without being religious about anything. …Mr. Gray says the project cost about $650,000, and was supposed to be good PR for the company, though the ongoing hurricane mop-up has kept the insurers from making hay from the accomplishment. But for what they call “the $2 million dollar bug” Team Gray might have beaten Stanley — their software slowed the vehicle on the flat lake bed segments due to processing overload attempting to scan the very broad possible road area.